Please join us for the annual IWGKS Kick off banquet at Smoky Mountain Pizza in Park Center on February 23 at 6pm. The event will usher in the beginning of the 2019 pond season and will feature a fabulous dinner spread that includes, salad, pizza, pasta dishes and soft drinks. Beer and wine will be available for individual purchase. There will be great raffle prizes and a guest speaker who will give a presentation on koi keeping. The all-inclusive price for the event is 20.00 per person. The banquet will also be the time to join or renew club memberships. Please mark the 23 of February on your calendar and join us for this fun event! 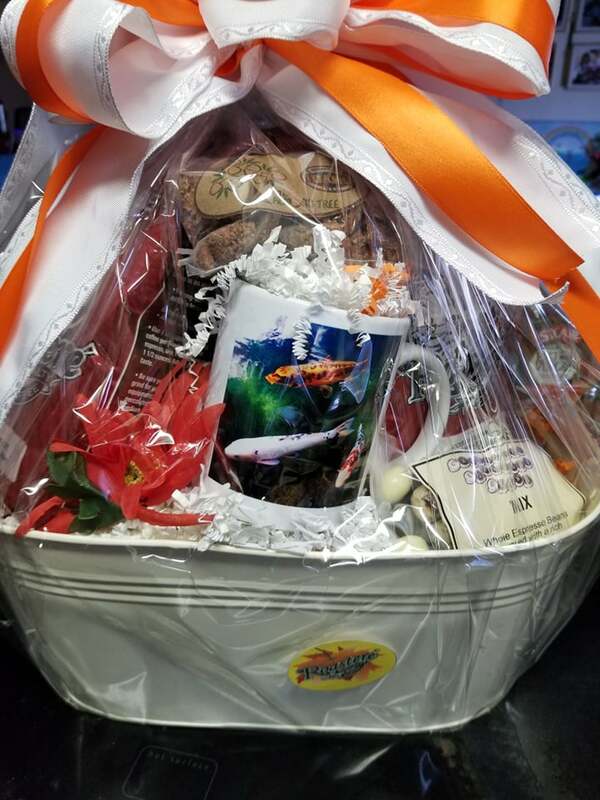 Great Gift baskets from Treasure Valley Coffee featuring a cool koi mug plus City Peanut shop nuts and candy! Bonsai tree, Steelheads Hockey Tickets and more for the raffle! You don’t want to miss this!